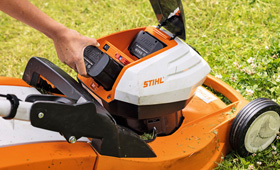 Mobile, high-performance battery-powered lawn mowers. Comfortable ergonomic mono handlebars allow for compact storage and user convenience. Easy to transport thanks to their light weight and compact shape.